Getting roadmap information out of me is usually about as rewarding as mining obscure crypto currencies, but for once I feel that this is a very good opportunity to talk a bit about the roadmap in the next half year, about EJBCA 7 and what is to come. JDK7 had its final support release over a year ago, which is one reason we've chosen to move on. 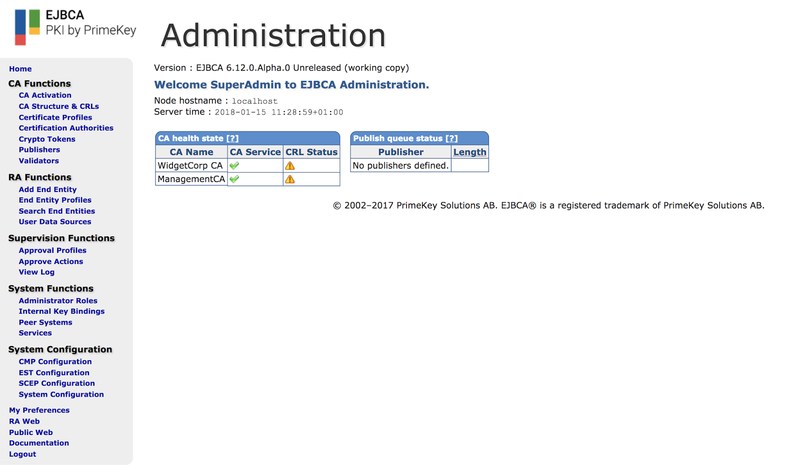 This means that your application server will have to be JBoss EAP 6.3.3 or later. 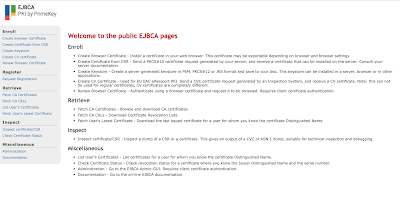 From EJBCA 7 and beyond we'll being using JDK8 features in the source, meaning that you will have to upgrade your JDK/AS before then. 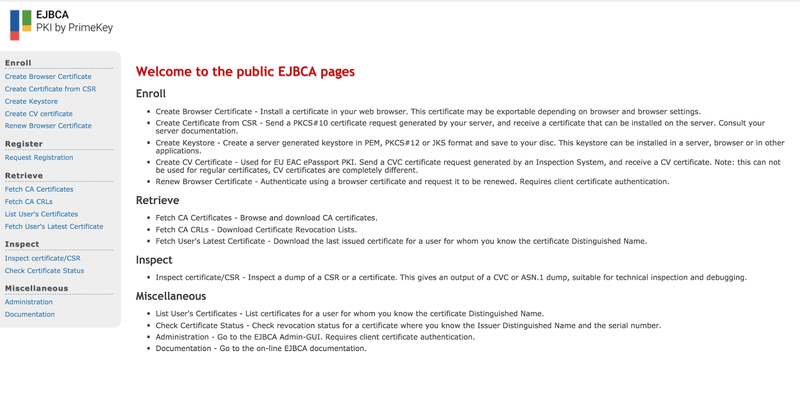 In any case we very much recommend upgrading to the latest version of EJBCA as well if you haven't done so yet. The primary changes you'll be seeing is that we're going to start optimizing and improving workflow in the existing UI. For that reason we'll be removing a lot of pages which have turned redundant or which are too antiquated to maintain. This is going to be the biggest change for many of you, and one of the most dramatic ones: the Public Web is going to be considered deprecated. The reasons for doing so are many, but foremost the fact that the new RA Web does (or nearly, but will do) everything the Public Web does, but better. While I hope that most of you have had a chance to explore and hopefully even start using the RA Web, this is a very good time to start migrating your workflows. If this leaves you with any sense of dread, fret not: we have documented how workflows translate between the Public Web and the RA Web here and here. Note that we won't be removing the Public Web initially but simply not link to, refer to or update it anymore, so there will be an overlap period. The first major change is a simple one: a question of branding. We have traditionally, both in code and in UI misused the terms Administrator and Administration. 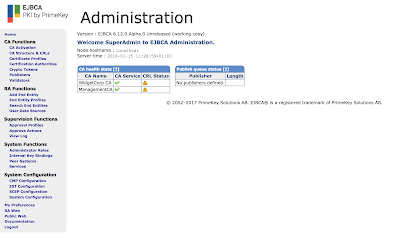 In the line of defining an administrator as somebody who performs administrative tasks (which doesn't cover all users of the UI) we'll be renaming the current Admin Web as the CA Web to reflect the fact that its purpose mainly covers setting up CAs and profiles, while the RA Web covers all aspects of of end entity creation and lifecycle management. All of these pages have superior analogues on the RA Web, and it's our goal that our workflows become so intuitive that there will be no need to switch between the two. In addition to this, I'd like to let you know a bit about workflows in the UI. Currently the workflows are what could generously be called unintuitive, which is something we're looking to remedy come 2018 and beyond. The design currently largely mirrors the architecture, which while straight forward from a developer's perspective requires way too much domain knowledge from a user's point of view. Our ambition is to start refining and redefining workflows during the coming year to make more sense from what one is trying to accomplish, but we'll be doing so gently and properly documenting and motivating all changes. We hope you're looking forward to these changes as much as we are!